Regular compound interest is (basically) the way most loans and savings accounts work, including home mortgages. 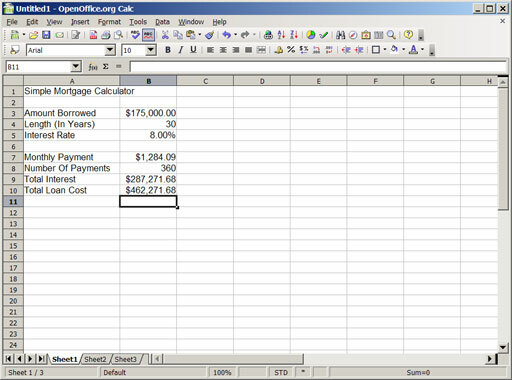 Here, we’re going to use a spreadsheet to calculate a home mortgage payment estimator (and even a full payment schedule) using the principles of compound interest. 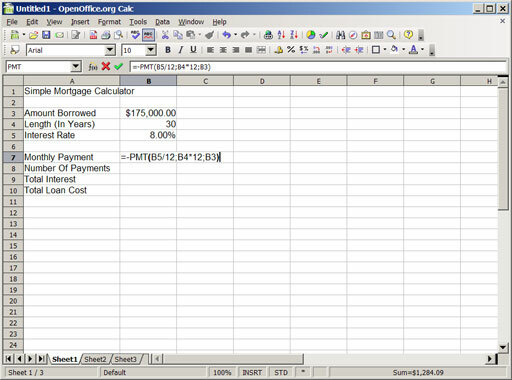 This PMT function is a part of the spreadsheet that calculates how much a monthly payment will be for you. The interest on each payment will be 1/12th of the annual rate (hence the B5/12 part) but you’ll be making 12 payments a year (hence the B4*12 part). The number that appears here is the actual cost of a monthly payment given the terms you set up in B3, B4, and B5. You can change the first three numbers however you want to look at various different possibilities. Want to make it even cooler? In cell A13, write Month 1, then click and drag the black square down from that cell until you can see month 360. 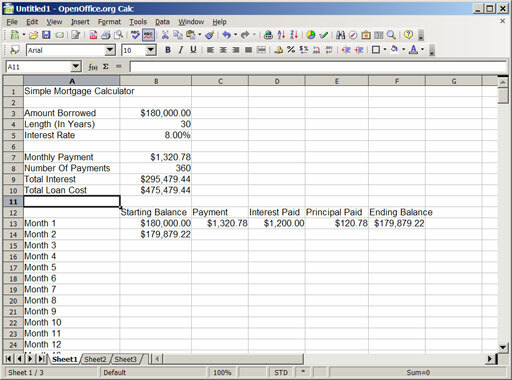 Then, in B12 through E12, add these labels: Starting Balance, Payment, Interest Paid, Principal Paid, and Ending Balance. Yep, we’re going to see what exactly each payment is doing. To set up the numbers, you’re going to have to enter some more formulas into the first couple rows of this little table, but after that, you can just drag down to fill in the rest. You can click on the cells B14, C13, D13, E13, and F13 and drag the black square in the lower right of each one all the way down until it lines up with Month 360. Don’t worry about weird values until you’ve done all five columns. When you’re done, you’ve got a full mortgage amortization calculator – and you understand completely how the math works! Be sure to save this file for later – it’s useful! 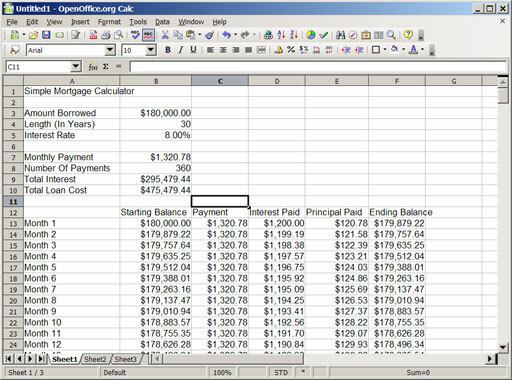 Now that you’ve assembled your own mortgage calculator, you can see that the possibilities of using spreadsheets to do personal finance calculations are endless. Good luck!